With ongoing legalization cannabis edibles are on the rise and marijuana enthusiasts are looking for new ways to enjoy their favorite plant. There is a vast amount of cannabis edibles that are quite easy to make. It is simply the same food that is eaten regularly with some marijuana added into the mix for some extra beneficial compounds as well as a nice relaxed high. Quesadillas are a little less well known than the standard cannabis consumables – brownies, cookies and crackers – but they can taste just as good. A lot of the typically consumed food can be infused with marijuana, particularly those that involve eggs, dairy and flour. 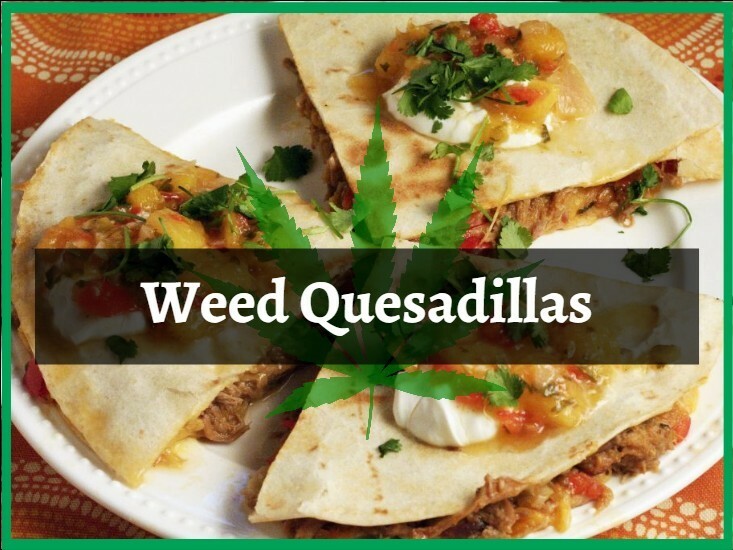 The following is an easy to follow set of instructions on how to make weed quesadillas. When you use cannabis butter or cannabis oil it makes the recipe much easier as opposed to improvising with your own marijuana. However, all you have to do to make medicated oil is simply shred some marijuana, put it into your chosen oil in a pan and simmer for 20 minutes. Drain off the excess and you have wonderful medicated marijuana oil. This recipe is for two people, in case you need to share. And it is a shrimp Quesadilla, but you can replace shrimp with another meat or vegetable if you wish. To begin, take your small pan and heat up the oil or butter. Add the peppers until they are soft, which should take roughly 5 minutes. Add the raw shrimp and cook for around a minute or two. Add the scallions and cook for 3 minutes. Place in some salt, pepper and oregano as required. You now have your Quesadilla ingredients, place them aside into a bowl. Now you need to go about building your Quesadilla. Put the pan back on the stove and heat it up. Add some canna oil or another type of oil if it is too dry. Place the tortilla onto the pan and put half of your mixture on top of the tortilla. Place half a cup of mozzarella cheese onto the tortilla. Place the other tortilla on top and press down so everything is together. Cook for a minute or two and remove from the pan. Cut it into 4 slices for that classis quesadilla style. Remember that you have only used half of the ingredients, you so have enough left for another person. Alternatively, you can double down on your Quesadilla and marijuana intake!